What Can Ofwat Do For West Lancashire? When West Lancashire MP Rosie Cooper told us that the Chief Executive of Ofwat Cathryn Ross had agreed to come and speak to local residents here in West Lancashire about what Ofwat does and how it works with utility companies on investment plans to mitigate flooding risks, interest was high especially in Burscough, Halsall, and parts of Ormskirk. With a presentation from Ofwat on its role and its links to flooding, Rosie also arranged for United Utilities (UU) to deliver a presentation and field questions from members of the public about their role, and their network with increasing house building in West Lancashire. 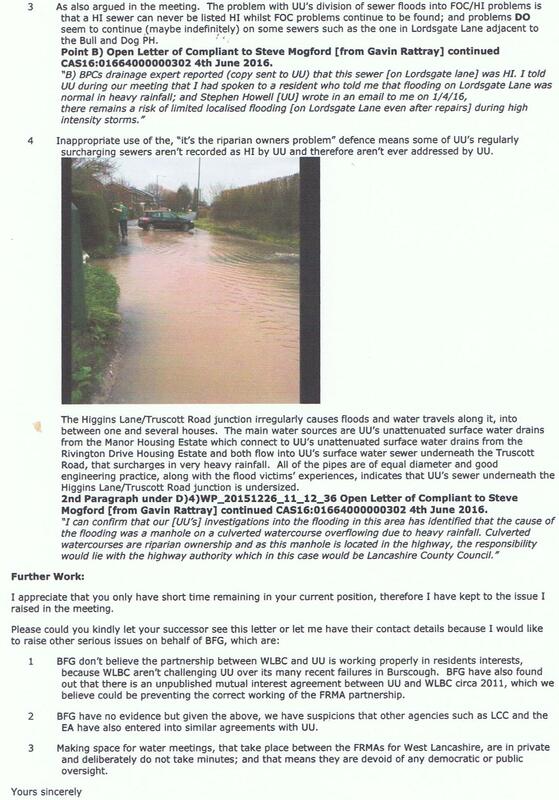 UU does not enjoy a high reputation in West Lancashire with its record of increasing private profits and decreasing public services that leave homes flooded and raw sewage in evidence. Ofwat has duties set by sections 2 and 3 of the Water Industry Act 1991 (WIA91) as amended, including “secure that water companies (meaning water and sewerage undertakers) properly carry out their statutory functions” and “secure that water supply licensees and sewerage licensees properly carry out their licensed activities and statutory functions” and “further the resilience objective to secure the long-term resilience of water companies’ water supply and wastewater systems; and to secure that they take steps to enable them, in the long term, to meet the need for water supplies and wastewater services”. Readers might now wonder why, if Ofwat has legal powers to require water and sewage undertakers to carry out THEIR statutory functions and licencees to properly carry out THEIR statutory functions, how does UU not face regulatory action by Ofwat. In short, how is there such an obvious deviance from law and practice? Catheryn Ross will shortly be leaving Ofwat with a legacy of success. She took over when the regulator was at its lowest ebb. Fresh from the section 13 debacle to modify water companies’ licences, relationships with the water companies were in tatters and Ofwat had a multi-million pound hole in its budget as it prepared for the price review. Four years later, things look very ¬different. Ross was respected and even liked by the companies she regulates. She is widely seen to have been a firm and fair regulator who has achieved significant transformation of both her own organisation and the sector during her tenure. Where does that leave West Lancashire? 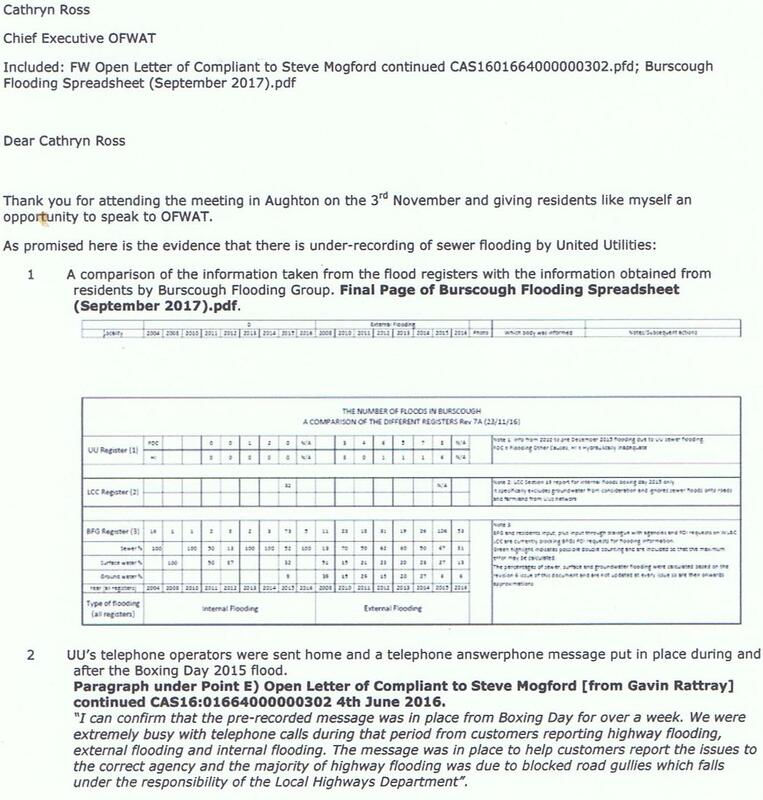 After the public meeting during which many issues were raised by those concerned with the ongoing mess of floods and sewage in houses, Cathryn Ross patiently listened to residents, including Halsall Parish Councillor Neil Campbell who gave her a large dossier about the New Cut Lane issues, and Gavin Rattray of the Burscough Flood Group who wrote the letter below [click to read]. It is to be hoped that Ofwat can do to UU what WLBC and LCC fail to do, force them to provide public services that equate to this century and not those of the Victorian age.